Thanks! I didn't know it was a meme? Searching Google Image search, was it this picture you saw before? Yes, I'm pretty sure that's the one. If that's all you found, I suppose technically perhaps it isn't a meme, then. But I'd be surprised if the request was an entire coincidence. 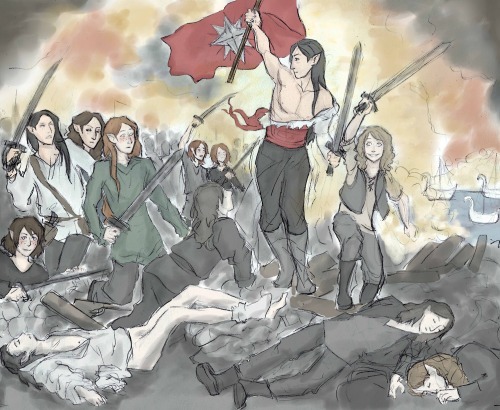 They declared a day in celebration of the Flight of the Noldor on Tumblr, some time ago--I forget which date it was and what exactly they called it--and this picture was re-blogged a great many times. Most of the Tumblrites who re-blogged seemed to have stronger pro-Feanorian sympathies than I gather you do. Readers' reactions to the different aspects of Feanor's speech in Tirion vary quite a lot, of course.